The Haida fashioned for themselves a world of costumes and adornments, tools and structures, with spiritual dimensions appropriate to each. The decorations on the objects they created were statements of social identity, or reminders of rights and prerogatives bestowed on their ancestors by supernatural beings, or of lessons taught to them through mythic encounters with the animals, birds, fish or other beings whose likenesses were embodied in the crests passed down through generations. The abstract concept of art for art's sake had little meaning for the Haida, but they had exceptionally high standards of craftsmanship and the desire to constantly improve their skills. 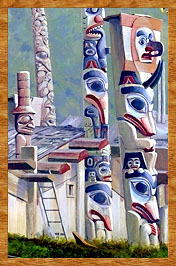 As inhabitants of an archipelago that lacked many of the prized natural resources available on the mainland -- such as mountain sheep or goats, major runs of eulachon fish, mineral pigments, and specialized stones and metals for tools -- the Haida began about 2,000 years ago to trade in order to maintain status among their neighbours. What they offered in exchange were products of skilled workmanship, especially their exceptional canoes, but ranging over a great variety of objects such as carved and painted chests, as well as other furnishings appropriate to the potlatch feasts of all the other north coast tribes. They imported the raw materials that they lacked and processed them into highly refined products that they then exported to other tribes on Vancouver Island and the mainland. Such items included copper shields, silver and copper jewellery (after the late eighteenth century), as well as horn bowls, ladles, spoons, and possibly goat's wool blankets. The Haida excelled in making and engraving copper shields, and examples of their work have been collected from the Tsimshian, Tlingit, Kwakwaka'wakw (or Kwakiutl) and most other peoples of the coast. From the first days of contact, the Haida tailored their production of art to European and American requirements. Just as the traders catered to the Haida by setting up the shipboard manufacture of iron and copper implements and even items of clothing, the Haida developed art and crafts that appealed to the traders. Most popular were small carvings made of argillite (a soft black stone), items of ivory and silver, as well as a wide variety of wooden and basketry "souvenirs." Literally thousands of such items, collected before the end of the sea otter trade in the 1830s, have turned up in the New England states and the British isles. Numbers of them have found their way into museum collections.